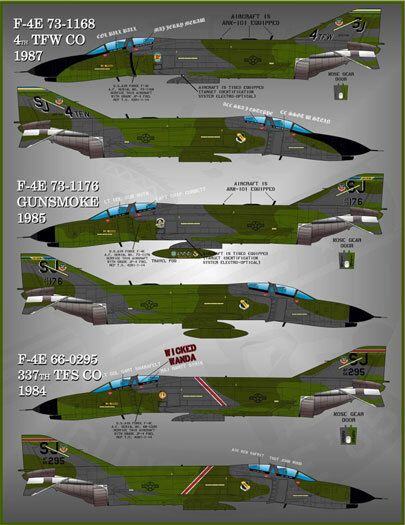 This is Afterburner Decals second sheet covering the Mc Donnell Douglas F-4E Phantom in service with the 4th Tactical Fighter Wing (TFW) based at the Seymour Johnson Air Force Base, North Carolina in the late ‘80s and early 90’s. 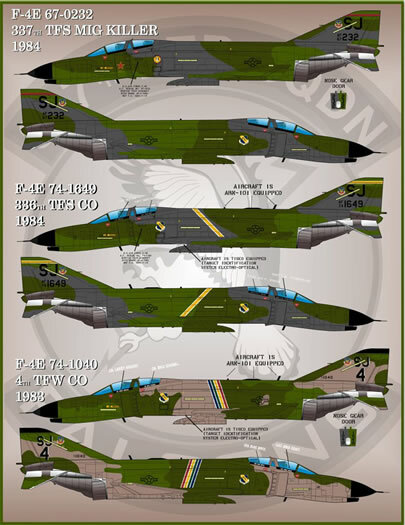 This sheet provides markings for nine machines from the 80’s in all; in a mixture of Southeast Asia (SEA) and the later Europe I (Euro 1) camouflage schemes. F-4E serial number 73-1168. This was the Commanding Officer of the 4 TFW’s bird in 1987. It is finished in a wrap-around Euro 1 scheme (Federal Standard 36081 Euro grey, Federal Standard 34102 medium green, and Federal Standard 34079 dark green). It has a unique black anti-glare panel with 334th TFS shield on the port intake and a 4th TFW shield on the starboard intake. The vertical stabilizer cap is decorated with a white bordered blue yellow and green chard-wise band, a Tactical Air Command (TAC) shield, white shadowed SJ unit designator and 4th TFW title. The other unique markings are air and ground crew names applied to black painted canopy rails in white “Old English Text” font. This machine is fitted with both the ARN-101 navigation, weapon delivery, and sensor management system - the black antennae on the spine (this system provides all-weather navigation and weapon delivery capabilities) as well as TISEO Target Identification System, Electro-Optical system (the cylindrical fairing on the leading edge of the port wing). F-4E serial number 73-1176. This machine was a 4th TFW entrant in the 1985 Gunsmoke competition held at Nellis Air Force Base, Nevada. In the same colour scheme and basically the same markings as the previous option but without an anti-glare panel and a more conventional black radome. Other unique markings include a Gunsmoke ’85 shield on the port intake as well as white edged chord-wise band in wing colors across the top of the vertical stabilizer that incorporates 4th TFW titles in black. The machine also carried a travel pod and markings are provided for this as well. Fitted with ARN-101 system as well as TISEO too. “Wicked Wanda” - F-4E serial number 66-0295, belonging to the Commanding Officer of the 337 TFS, circa 1984. Finished in Euro 1 scheme with a diagonal white bordered red sash across her spine and a chord-wise white bordered band across the top of her vertical stabilizer. Wing and squadron shields on the intakes and the name “Wicked Wanda” applied on the port side canopy rail between the front and rear cockpits. F-4E serial number, 67-0283. A 337th TFS line bird from 1985 and a drone killer. The aircraft is in wrap-around SEA camouflage finish and carries squadron, wing and TAC shields as well as a red chord-wise band across the top of her vertical stabilizer. 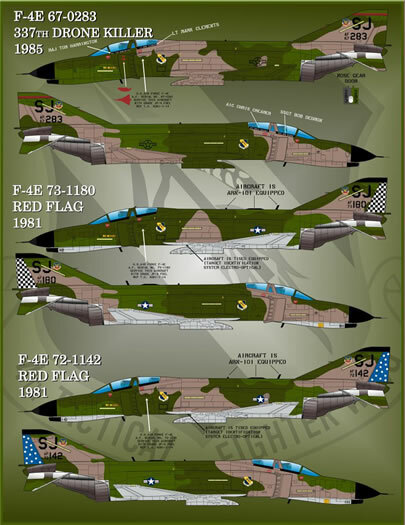 She also carries red “kill” markings to record her shooting down two drones – one looks to be a plan view of either an F-102 or an F-106 and I can’t identify what the other marking represents. F-4E serial number, 73-1180. A 4th TFW entrant in the 1981 Red Flag competition held at Nellis Air Force Base, Nevada. She is in the SEA 1 scheme, fitted with both the ARN-101 system and TISEO. The fin cap is black and she sports a black and white chequered rudder (the provided decal is black only so you will have to paint the rudder white first). National insignia is of the high visibility type. F-4E- serial number 72-1142. Another 4th TFW 1981 Red Flag entrant she is in SEA II scheme with a black fin cap and a blue and white polka dotted rudder (the rudder decal for this is just blue so you will have to paint the rudder white first so as you get white polka-dots). High visibility national insignia as well. F-4E serial number 67-0232. A 337th TFS bird from 1984, she is in wrap-around Euro 1 camouflage scheme. She has low visibility national insignia, full colour squadron, wing and TAC shields as well as a red chord-wise band across the top of her vertical stabilizer. She also wears a yellow bordered Soviet star on her port splitter plate to celebrate her MiG kill by Captain G.M. Rubus and Captain J.L. Hendrickson on 15 October 1972 when she was assigned to the 307th TFS 432nd TRW. F-4E serial number, 74-1649. As flown by the Commanding Officer of the 336th TFS in 1984. In wrap-around Euro 1 camouflage scheme with white bordered yellow sash over her spine and a chord-wise band on her vertical stabilizer. Wing shields to both sides of her intakes and a TAC shield on her vertical stabilizer. Low visibility national insignia and fitted with the ARN-101 system and TISEO. F-4E serial number, 74-1040. The final option is the Wing’s Commanding Officer’s bird from 1983. In wrap-around SEA scheme with low visibility national insignia. Colour is provided by a sash over her spine in wing colours separated by thin white stripes. Fin cap is black with white shadowed unit designator and large numeral 4 on her vertical stabilizer. Fitted with the ARN-101 system and TISEO. 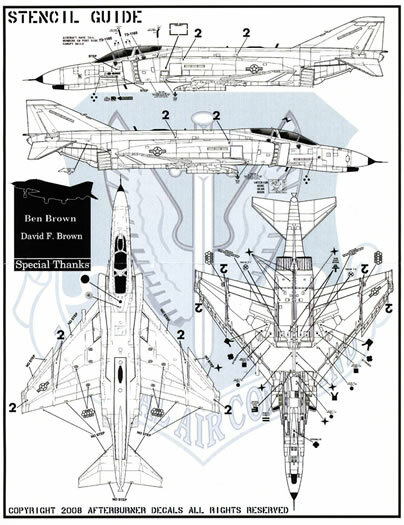 The placement guides are the well up to the high standard set by Afterburner Decals when they first burst onto the market. Three A-4 sized sheets are provided that show full colour left hand and right hand side profiles of each option as well as upper and lower plan views of each of the three different schemes worn by the sheets options – nicely done! The back of one of these sheets shows large left and right hand side profiles as well as upper and lower surface line drawings to show the placement of stencil data – again these are nicely done as you can actually read the stencil data. The decals themselves (two sheets) are printed by Cartograf. Everything is in perfect register, including the intricate squadron and TAC shields. Opacity of the whites looks pretty good too which is a good thing as they have to go over the dark greens of both the Euro 1 and SEA schemes. Stencil data is plentiful too with two sets being provided including slime lights. Two sets of black stencil style national insignia are provided as is a single set of high visibility ones. Stencil data is also provided for the ejection sets. Two sets of black spine walkways are also provided as are two sets of (different style) wing walkways. 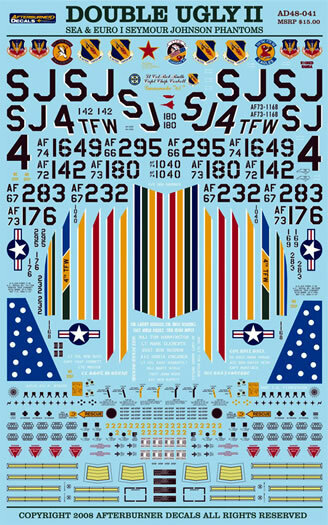 As with the other Afterburner Decals Phantom sheet, the spine walkways are provided as five part decals so you will require a little patience to align them correctly. The three placement guide sheets and the two decal sheets come packed in a clear plastic zip-loc bag. 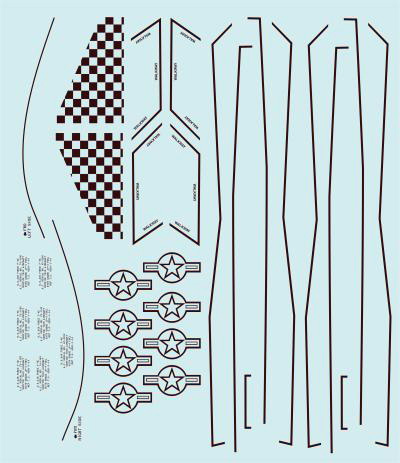 The placement guide advises that the decals are sized to fit the Hasegawa 1/48 F-4E kit but be aware that you need to get the one with the wing slats. You will also need to scratch build the ARN-101 antennae too but if my memory serves me correctly, the TISEO is included in the box. Afterburner Decals have done a great job with this one. You get markings for nine different machines in three different colour schemes backed up by first rate support material. Well worth the price as far as I am concerned.